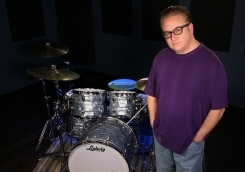 Pat is widely recognized as one of today's most prolific drummers, and a world class clinician. Whether it's a deep pocket Funk, or swampy Roots groove, or a fiery fusion fill, Pat can bring it all together with musicality, finesse, and uncanny technical ability. He has performed and recorded with a wide variety of artists in numerous genres, from R&B legends Gloria Gaynor and Patti LaBelle, to Pop/Rock artists Glen Burtnik and Patty Smyth, to smooth jazz artists Ed Hamilton and Gerald Veasley. He has also played the original Broadway productions of A Chorus Line, Grease, and Footloose, as well as a national tour of Dreamgirls. Groovallegiance is Pat's newest project, featuring bassist Gary Grainger, Guitarist Chieli Minucci, and keyboardist David Cook. The debut release in Spring 2009 will feature 10 songs, plus play along tracks for each song, studio video clips and pdf charts. Pat is one of the most sought after educators and clinicians in the business, and is a full time faculty member at Drummers Collective in NYC.and is a full time faculty member at Drummers Collective in NYC. Pat's DVD/Book from Hudson Music, Hands, Grooves, & Fills has gained international acclaim since its release, and has placed in the Modern Drummer Readers Poll in 2008. He is also a featured artist on drummerworld.com, as well as on the Ludwig 100th Anniversary DVD, and LudwigTV. Pat also has designed the new Ludwig Practice Pad, the P4, which is gaining worldwide recognition as a revolutionary new design in practice pads, and one of the most innovative new percussion products in the drumming industry today. He also endorses Zildjian Cymbals, Remo Drumheads, and Vater Drumsticks, with a signature stick in the making that will be available in stores.